Mel Carnahan (Democrat), the 40th State Treasurer, was born Feb. 11, 1934, in Birch Tree in Shannon County, Mo. He attended grade schools in Ellsinore and Birch Tree. He spent significant time in Washington, D.C., as his father, the late A.S.J. Carnahan, served seven terms as Missouri's 8th District Congressman. He graduated from high school in Washington, D.C., and earned a Bachelor of Arts in Business Administration from George Washington University. Upon graduation, Mr. Carnahan entered the United States Air Force where he achieved the rank of first lieutenant, serving as special agent for the Office of Special Investigation. He then returned to the University of Missouri School of Law in Columbia, and received his degree in 1959. In 1980, Mr. Carnahan was elected state treasurer. During his term as treasurer Mr. Carnahan modernized money handling and investments. He utilized the most up-to-date methods for prompt transfer of funds, awarded the main banking business on the basis of competitive proposals and instituted a Fast Funds Collection System to concentrate cash for investment coming from more that 175 of the State's collection accounts. 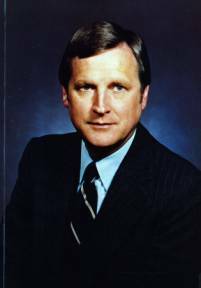 In 1988, Mr. Carnahan was elected Missouri's 42nd Lieutenant Governor. He was subsequently elected as Missouri's 51st Governor on Nov. 3, 1992 and re-elected for a second term on Nov. 5, 1996. Mr. Carnahan married Jean Carpenter in Washington, D.C., on June 12, 1954. They have four children. On Oct. 17, 2000, a plane carrying Governor Carnahan, his son Randy (Roger) and a senior campaign advisor Chris Sifford, crashed in a woody area in Jefferson County. There were no survivors. At the time of his fatal crash, Governor Carnahan was running for U.S. Senate. Governor Carnahan was the Democratic candidate running against incumbent Republican Senator John Ashcroft. Under Missouri law, even though Governor Carnahan was deceased at the time of the election, his name was to remain on the ballot. The lieutenant governmor who was sworn in as governor was Governor Roger Wilson. Governor Wilson would choose a person to serve as U.S. Senator if Governor Carnahan won the seat. On Monday, Dec. 4, 2000, Governor Roger Wilson appointed Jean Carnahan, widow of the late Governor Carnahan, to the U.S. Senate effective Jan. 3, 2001.